Bright Stars Edmonton is set in modern, purpose built premises offering plenty of space, light, fresh air and a large outdoor play area for children over 2 years of age with a smaller garden for children under 2 to play and explore outside safely. The variety of toys and equipment on offer reflects our commitment to ensuring that children are provided with stimulating experiences and enjoy their day with us. We provide day nursery care and education for children from 3 months 5 years daily from 08:00-17:45 for 49 weeks of the year (we are closed for 2 weeks in August and 1 week between Christmas and New Year). We have ample parking facilities and are located within 5 minutes walk of Edmonton Green BR Station and its Bus Station offering easy access to central London and other areas. We offer quality care and education, a healthy menu of food freshly cooked by our chef daily and a structured preschool curriculum with nursery education grants for qualifying 3 and 4 year olds. We have two separate rooms for our under 2’s who are cared for by qualified and experienced staff. Babies are provided with a safe and nurturing space where they can interact with each other and toddlers are provided with a more challenging environment in preparation for their move into our main hall. Our Main Hall provides a stimulating environment for children in these age groups where staff encourage their progress through the 7 learning areas of the EYFS (Early Years Foundation Stage) guidance. Children are separated in their age groups for different activities, such as circle time and specific curriculum activities but join together for all meals thereby creating a homely environment where older children are encouraged to support the younger ones and learn important self-help skills, such as serving themselves. 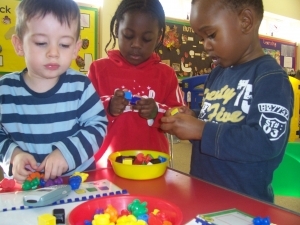 We carry out a variety of extra-curricular activities at Bright Stars – Edmonton and these currently include French, Maths Fit and Jolly Phonics. Please ask for our Nursery Manager, Eileen, to make an appointment to view the nursery. A registration form will need to be completed to place your child on our nursery waiting list.